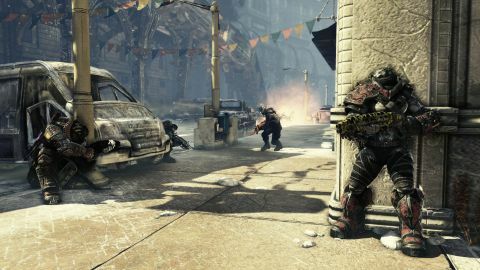 We won’t tease you for longer than this sentence – Gears of War 3 is awesome. The campaign is epic, with action sequences that are more intense, weapons that are more powerful, enemies that are more formidable and heroes that are more relatable than ever before. The multiplayer is extremely generous, with a horde of new maps and new modes that are instant classics, as well as perfectly suitable for either competition or cooperation, experts or beginners. All aspects considered, this is a spectacular shooter. Brumaks as big as Tyrannosaurs? We lost count of how many we faced. Corpsers that make the spider in Harry Potter or Lord of the Rings seem downright cuddly? They show up in multiple forms, from burrowing baby to seriously pissed-off mommy. Berserkers, the charging bulls of the Gears universe? Upgraded to leave trails of poisonous acid in their wake. Even regular enemies are scarier and nastier than before – the new breeds of Lambent Locust don’t just die when you shoot them, they explode into nightmarish second lives, full of squirmy tentacle arms and decapitated head snakes, requiring you to kill them all over again. It’s wild and it’s intense. Most of the missions and weapons are equally so, as if the developers behind Gears of War 3 know this is a last hurrah and want to throw every idea they’ve ever brainstormed, no matter how large or how ludicrous, into the game. You’ll vaporize opponents with a single blast of the One Shot rifle. You’ll bayonet them like kabob sticks with the Retro Lancer. You’ll hijack a blimp and dogfight other blimps across a missile-streaked sky. You’ll sit in a submarine’s turret bubble, hunting alien fish beasts and watching sunken BioShock-esque cities float by. You’ll launch huge catapults at huger targets a mile across the map, following the trajectory of your fiery, fleshy ammunition through a high-speed first-person perspective. You’ll visit everything from military bases to suburban supermarkets, from a city made of ash to a city made of money. And that “everything must go!” vibe extends to the characters as well. No, we’re not saying they all die (we’re not not saying that, either, of course) – what we mean is that, since this is a final act, nearly everyone gets at least one moment in the story to shine. Marcus Fenix is still the hero, but fan favorite Cole Train is the star of four heartwarming chapters, Dom’s search for closure with his wife Maria is featured prominently, and Baird actually comes across as lovable, or at least likable, by the end. Anya and new female lead Sam bring some welcome diversity to the squad, while Carmine brings unexpected badass-ery. Heck, you’ll probably even root for generically gruff Colonel Hoffman.